Discussion in 'Audio & Video' started by ans_unity, Dec 19, 2017. Hello @chafik_unity , when using Recorder to capture set of *.png images with transparency background for further processing in videoediting sw, the areas influended by ambient occlusion (applied using post-processing stack) seem to be transparent too. Is it a known issue or should it be considered as a bug? Win10, Unity 2018.3.b3, default empty scene, standard rendering pipeline (it means no LWRP or HDRP etc.). Skybox material removed; few boxes with default material, default light and camera. Apply Post-Processing stack 2.0.13, there apply Ambient Occlusion -> Scalable Ambient Obscurance. The results are in the attached pictures, as well as screenshots of camera and postprocessing settings plus recorder settins. The quality of the video does not looks good. Seems like it has a lot noise compare to original game view. Is that currently Video Unity Recorder didn't use GPU to do the recording? There are some issues with mp4 recordings however. If I try to record with mp4, there's no post-processing applied to the camera. While with webm there is post processing. Also, not related to this. If I use the animation window to play an animation the recorder does not work well. Where to submit bug reports for this package (and packages in general)? In our case, having recorder included with the package manager breaks the build process, because the samples have editor references. Looks like the Unity.Recorder.Samples asmdef includes the editor things but it's not tagged as editor assembly definition. /BUILD_PATH/Library/Unity/cache/packages/staging-packages.unity.com/com.unity.recorder@1.0.2-preview/Samples/Editor/RecorderEditorExample.cs(7,11): error CS0246: The type or namespace name `MenuItem' could not be found. Are you missing an assembly reference? I'm having trouble recording to an anim file from a Third Person runner game. I'm using Robot Kyle with a humanoid rig and the 3rd Person+ Fly asset but am getting errors when I try to play the anim file recorded with Unity Recorder. The Robot Kyle appears to move in world space but the running animations are not apprent. I have parented the 3rd person camera to Kyle and that appears to be moving OK. I'm also getting a "Binding Warning" in the Animator Inspector. I'm pretty much out of my depth here and would appreciate any pointers and am happy to provide any info. Ultimately I want to record the third person character and camera and use the resulting animation of gameplay with Cinemachine, so if there is a better way to achieve that I am all ears. Hi I am producing a trailer for a game with the recorder, great tool but videos are a bit pixelated (Full HD quality=High). Is there any way to improve the quality of the video? I'm more or less just wanting to ask a question regarding this package. I'm not interested in recording video or imagery but, am curious as to the animation recording. That said, for example, if I were to set up a player controller with all it's animations, WASD, Opening doors, etc... then play as the character, would it record the string of actions like walking a distance, peak around a corner, and then open a door, so that the string could be applied to a NPC for animating that character in a cut scene? I'm trying to use the Unity Recorder on version 2018.2.13f1 with the HD render pipeline but all recorders are outputting black frames. I recorded an animation clip of a moving camera with Unity recorder. The animation of the recorded camera should be imported into Maya. Hello @ans_unity , @chafik_unity - I hereby confirm the above mentioned bug also for the latest Unity 2018.3b7 and the Recorder - the bug is filled - case No. 1095732. Play mode becomes incredibly slow when I start a video recorder with 1080p resolution. The game is so slow (about half speed) that I am unable to record a realistic gameplay. 720p also slows down play mode (about 1.5 second is required to progress 1 second in game). Only lower resolutions (480p and lower) don't impact game speed too significantly. Does everyone experience this or is it just me? Because of that issue, recording a standalone build with OBS at 1080p appears to be a better alternative than Unity Recorder. We are putting the finishing touch to important performance improvements for recorder in 2019.1. Some of these improvements will be noticeable even when using previous Unity's versions (up to 2018.1) but optimal performance will be for the newest release. Our current tests on MacBook Pro (OSX) are showing encoding speed of 30-40 fps at 4K so I'm confident this will resolve the issue you are having. Any plan to improve recording quality? Currently the recording quality still not good yet. Another question, any plan to directly use GPU to record video? I believe currently it's output a series of static images then merge together as a video. Error in VideoMediaEncoder::Create create and setting attributes in ./Recordings/movie.mp4. Is there someone who know where the error could come from? Perhaps it’s from the experimental Unity Recorder or Windows 7 (https://forum.unity.com/threads/cinemachine-output-resolution-x1080p_fhd-do-not-work.576676/). Have a look at this video, it will show you how to export cameras to Maya with FBX. 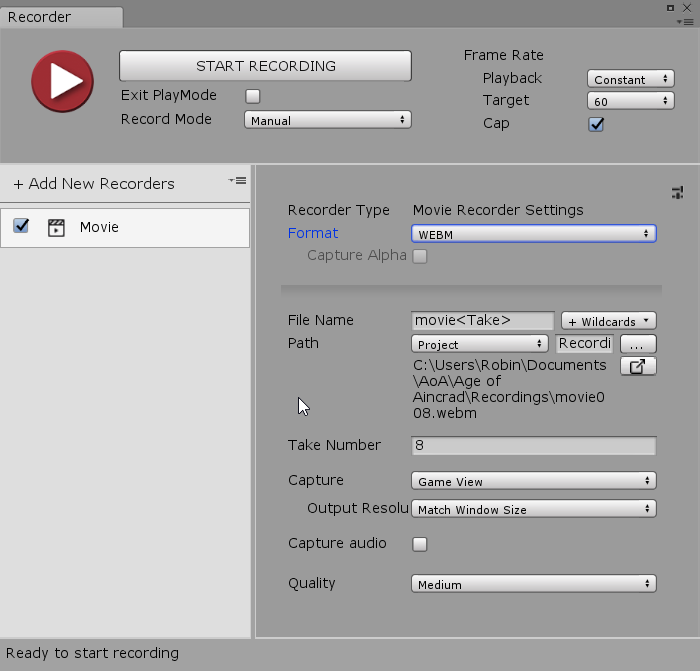 And here how to export recorded animations (using the old recorder). I hope this will help even though it's not the latest workflow the videos are showing. We are working at making new ones with the latest tools. Hey guys, Has anyone done something to automatically inject the metadata into the images so that autodetection of a 360 image by Facebook or YouTube, for example, will work properly? Is this a feature that has been discussed for Recorder? Also, Just a quick note about the posts I've seen here about the image quality of mp4. This video format is "LOSSY", which means the codec crushes like values into one another to make the frame size smaller. Its more about making a smaller file size than it is a quality one. Use frame output and run out those frames using AfterEffects or Premier for a higher quality, larger file sized, movie export. Just my 2 cents. Have fun! This looks indeed like a Windows 7 limitation. the MP4 format encodes video in H.264 (and the WebM one in VP8). So I don't know yet for sure, but it looks like the decoding limitation could be the culprit here (even if we are doing encoding). That said I can confirm that the issue is not happening on Windows 10. So, unfortunately, there might currently be no way to workaround this except upgrading your version of Windows, or exporting into another format. I opened an internal bug report so we can keep this in our scope and worst case scenario add a proper error message. ps: @Barabicus, that might also be your issue. Are you using Windows 7 ? @_eternal, I guess this also answers your question. A lot of concerns about the Video Quality has been raised. We are indeed aware of those issues and are currently working at a better way of setting and exposing the codec parameters, so anyone can reach the level of quality one needs. But as it is related to Unity Core and each OS Video API, it is a slower release timeline. codegasm and optimise like this. Thanks for the reply. I hope in future it will have very nice recording quality + fast recording speed like Bandicam and output size is smaller like Bandicam. I gave a try : added a grading to a scene and exported a WebM + a MP4 with no issue. So : what version of Unity, Recorder, Render pipeline and Post-processing are you using ? What is your OS version ? Also would you mind providing a project demo-ing the issue so I can reproduce exactly your issue ? Hi! I have an issue with particles using UnityRecorder both in movie and image sequence mode. During recording game process are slowing down and particles emits by portions. In game, even when I using slow motion effect based on Time.timeScale particles emits flawlessly. If I choose Delta Time = Unscaled in ParticleSystem properties helps with emission, but shape and behaviour of whole particle system are incorrect. I wonder if the current UnityRecorder is compatible with Unity 2019.1 alpha? There is indeed a code deprecation that happens in 2019.1 that we need to address in Recorder Package. There is currently no way around it, Recorder code just needs to be updated at several places. But we are currently working on it. We will let you know when it is done. Just a quick word to let you know that a "recorder" tag has been created in Video / Audio and Animation sub-forums. This means, we will now encourage you to create separate threads (and tag them as recorder) to ask questions or discuss specific issues about Recorder. The idea is to answer and keep track of questions more efficiently and keep the "Unity Recorder update"
Hi @marief_unity, can you help me with particle issue with recorder? I did not try to reproduce your issue yet, but you could give a try adjusting "Maximum Particle Timestep" in Project Settings > Time and see if it helps. If not, please report a bug (In Unity, Help > Report a Bug...) so we can track your issue properly. Thanks for your report and patience ! Thanks @marief_unity for quick and informative response; such problems are quite understandable indeed. While working on Recorder code, it would be great to consider also the bug mentioned earlier and filled as case No. 1095732 - when capturing set of *.png images with transparency background (for further processing in videoediting sw), the areas influenced by certain types of ambient occlusion (applied using post-processing stack) are semi/transparent too (details & screenshots please see the bug report). In any case, wish you all luck and inspiration in further development! I've found that happened with particles. Yesterday I started making demo-project and realized that nothing wrong with particles during recording. Then I dive deep into my main project and found why particles behave so strange. The reason why is simple - car driving animation was recorded when Ridgidbody interpolation was enabled on it. And in particles properties Emitter velocity was set to Rigidbody. In game view in editor or in game itself it was non-visible difference, but during recording image sequence it had strange effect. So I've changed ParticleSystem Emitter velocity property to Transform and now particle systems behave as they must. The recorder seems to work well for me no blur or latency issues however the result (just recording the game screen not a full 360 view) is much darker that that displayed when viewing the game screen when playing. Does this ring any bells with anyone? Any suggestions on how to resolve this would be greatly received. * Is this happening in all your projects ? I'm producing a range of 360 training video materials in Unity using the 360 view feature to record them. As the camera changes locations for each section we want the users forward direction to face the main action. When recording using the Stereo option enabled the recording matches the forward direction of the camera when rotated at various points in the timeline. When using the same animated timeline but Stereo is disabled which we found gives a much crisper final image during play back on the Oculus Go, the rotation is fixed to the world forward direction ignoring the changing forward direction of the camera. If this could be a toggle option that would be great, reducing editing time required in reorienting all the videos. Thanks for the great work on this asset. Unity Folks. Does the beta release fix the issue with correctly recording VideoPlayer output? If not, when do you think this issue will be addressed? Thanks. If not, would you mind adding some details regarding the issue you are talking about ? @marief_unity, I am talking about the comment by Chafik Achache when asked why the video recorded from a VideoPlayer runs several times faster that it should: "Unfortunately the Recorder does not work well with the VideoPlayer. The VidePlayer is real-time based while the Recorder adjust the playmode update to fake the targeted fps. So while the final video is encoded in 30fps it took more than 1sec to process 30 frames (in your case it took 6sec to process 30 frames)". I was wondering if there is a solution to this on the horizon or if I should look at animated textures for my project. Correctly recorded video playback would make my life so much simpler. Thanks. Mike. This issue is indeed known and we plan on working on it sooner than later but it is going to take time. So in the meantime, I would suggest you indeed try to investigate workarounds. Just gave a try with 2018.3.0b12 with no issue. I double-checked the code, and could not see any lines that could trigger this. I would first try to remove the package and re-import from the Asset store. If you are still experimenting issues, please open a new thread and add the recorder tag on it (that way I'm automatically notified) so we can discuss more. * Enclose your editor.log (see https://docs.unity3d.com/Manual/LogFiles.html). having recorder included with the package manager breaks the build process, because the samples have editor references. Looks like the Unity.Recorder.Samples asmdef includes the editor things but it's not tagged as editor assembly definition. Hi, how do i remove this from my project? Assuming you installed it from Asset Store, just delete the "Unity Recorder" folder in your "Assets" folder. Hi I may have gotten it from git, not 100% sure.. For some reason when ever I delete it, and then recompile, it automatically re-installs itself, and im building for android so when i try to build i get build errors. Hum, I'm missing some information to be able to help you. 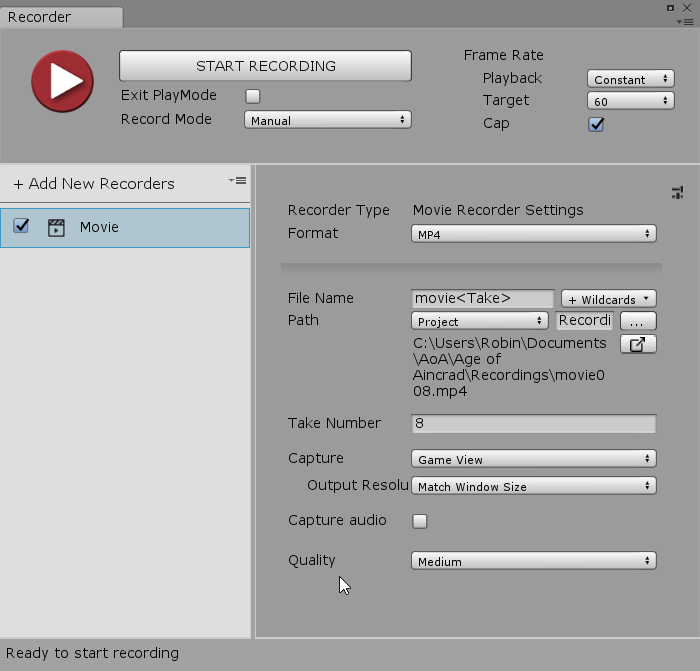 Would you mind opening a new thread in Video / Audio forum and tag it Recorder ? Please include the error message you have, the version of Unity and of Recorder you have using, the location of Recorder in your project structure. Including a project that is demoing the issue would be great too. Hey I was able to remove it, kind of. Not a big deal now as its not interfering thanks for the help! I record 360 stereo video and my cpu is using only 23% max. I have pretty powerful machine (i7-7800x, 64 ram and 2x1080ti). But render time for 60 seconds are 2h. Can some one have a clue where is the problem? Would you mind opening a new thread and add the "recorder" tag on it ? - Is it only slow for 360 stereo export ? - If you create a new project and record a simple scene, is it still abnormally slow ? - Do you see error in the console while recording ? I have a problem with the fps between unit and maya. I'm recording an animation clip with the unit, but when you import the animation on maya, the fps do not match. On unity register at 25 fps. Before importing the animation on maya, set the preferences to 25 fps. When import to maya, the animation is 60 fps. How can I keep 25 fps on maya? Why I have Maya 60 fps when I register with 25 fps and set Maya at 25 fps? I need some help from you. maybe has someone here could help me. Let me try to explain. Every time when I tried to recorder something I have this problem. I need to know how I fixe this problem otherwise I can't make a clip. When I press to Recorder. I hope has someone here could help me. I can't get Record 360 view (To MP4) to record UI (WorldSpace), my Game is a VR Game (using the SteamVR puglin) and I use Recorder to record 360 gameplay sessions. Except the absence of all UIs everything else work fine, any ideas ? Assets/Unity Technologies/Recorder/Framework/Inputs/Animation/Editor/AnimationInput.cs(2,32): error CS0234: The type or namespace name `Animations' does not exist in the namespace `UnityEditor.Experimental'. Are you missing an assembly reference? Assets/Unity Technologies/Recorder/Framework/Inputs/Animation/Editor/AnimationInput.cs(10,16): error CS0246: The type or namespace name `GameObjectRecorder' could not be found. Are you missing `UnityEditor.Animations' using directive?